Other Products by Ground Based Nutrition. Search other Pre-Workouts products. Ground-Based Nutrition Organic 100% Natural Pre-Workout is jam packed full of organic goodness. From Organic Goji Berries to Organic Wheat Grass, this pre-workout products has got your nutritional needs for training covered and then some. Organic Plant-Based Performance at its Best! 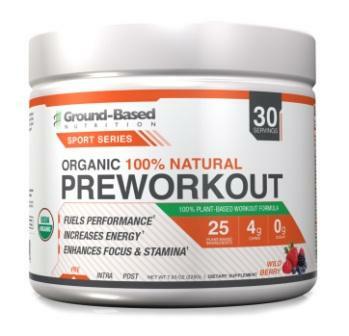 This Organic Pre-workout has been developed to help athletes perform at their absolute peak, without having to sacrifice their health in the process. After all, we need a solid state of general health in order to reach our goals. This product truly is a plant-based performance enhancement system specifically developed for this purpose. This product contains potent adaptogenic herbs, that assist in physical and mental adaptation to exercise. Included are 3 of the most powerful herbs: Indian Ginseng (Ashwagandha), Siberian Gineng and Rhodiola Rosea. Withania itself has demonstrated some remarkable effects, such as reducing cortisol levels, inflammatory markers and boosting a hormone precursor called DHEA1. Ground-Based Nutrition Pre-Workout is designed to enhance energy, mood and motivation, through the inclusion of naturally sourced caffeine, adaptogenic herbs and tonics. This product also contains naturally-sourced antioxidants, which are helpful for quenching the free-radicals that are especially generated during aerobic exercise. Organic Nitric Oxide enhancers have been included, such as beetroot, which provide natural nitrates and other novel phytochemicals2. These assist with the circulation of nutrients to muscle tissue during exercise and may enhance the physical sensation of muscle engorgement during resistance exercise. Take 1 scoop (7.5g) of Ground-Based Nutrition Organic Pre-Workout 30 minutes before exercise mixed in 300ml cold water. If you are unsure of your level of caffeine sensitivity, you may like to begin with a ½ scoop taken before lunch time. Organic Pomegranate Juice, Organic Red Beet Juice, Organic Red Beet Root, Organic Acai. Organic Green Tea Extract, Organic Goji Berry, Organic Watermelon, Organic Matcha Tea, Organic Caffeine from Green Coffee Bean, Organic Strawberry. Organic Maca, Organic Siberian Ginseng, Organic Ashwagandha, Organic Rhodiola Rosea, Organic Rosehip, Organic Acerola, Organic Nettle Leaf, Organic Turmeric, Organic Red Clover Extract, Organic Olive Leaf, Organic Schisandra. Organic Barley Grass, Organic Wheat Grass, Organic Agave Inulin, Organic Ginger. Other Ingredients: Natural Flavouring, Organic Stevia. Contains no artificial ingredients, preservatives, colours, fillers or sugar. The major precaution with pre-workouts is the caffeine content. For instance, Ground-Based Nutrition Pre-Workout, even though it is all-natural and Certified Organic, contains 100mg of caffeine per scoop, which is equivalent to around 1 cup of standard brewed coffee. If you are particularly caffeine sensitive then it is best to stick to non-stimulant pre-workouts. Some pre-workouts contains nitric oxide boosters, which should be avoided if you are prone to low blood pressure or postural hypotension.